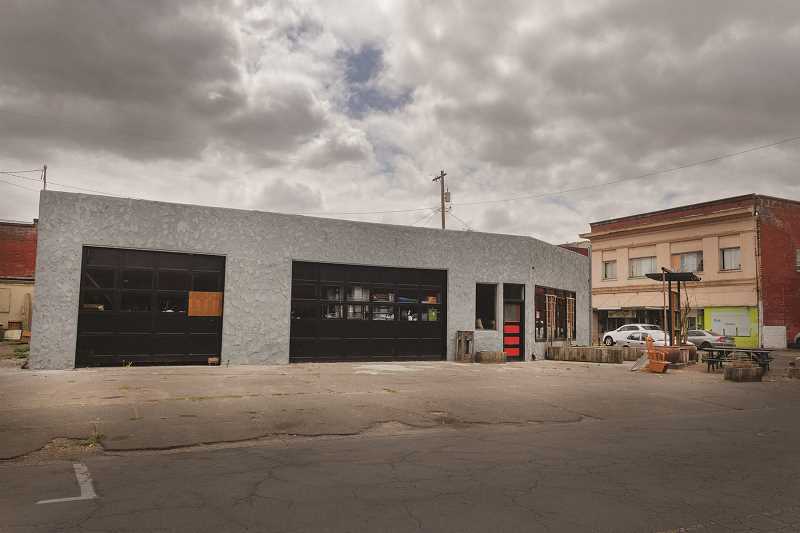 The owner of the old gas station at 173 Grant St. in downtown Woodburn was fined $1,959 by the Oregon Department of Environmental Quality in June for failing to test corrosion protection systems on underground gasoline storage tanks on her property. Owner Karen Frackowiak, of Canby, did not appeal the fine to the Environmental Quality Commission. It was the third fine imposed on an owner of the Grant Street property in two years. In 2016, DEQ fined previous owner James Frackowiak twice that amount for the same violation, for a total penalty of $4,503. James Frackowiak bought the property in 2012, and transferred it to Karen Frackowiak in 2017, but James Frackowiak is apparently still managing the property. The Oregon State Police investigated Frackowiak for his violations in 2016 and referred the matter to the Marion County District Attorney for prosecution, according to DEQ public affairs specialist Katherine Benenati. The DA did not pursue the matter further and closed the case, according to the DA's office. DEQ's fines for violating the testing regulation are determined using an equation that includes an assessment of the violator's previous actions and knowledge of regulations. Had James Frackowiak remained the owner of the Grant Street property, the fine for the violation could have been substantially larger due to his previous violation and his knowledge that testing of the tanks was required. Underground storage tanks are required under Oregon environmental regulations to be tested every three years to prevent leaks and contamination of soil and ground water, but the tanks at the Grant Street property have not been tested since 2006. Testing of corrosion prevention systems is vital to preventing potential leaks of petroleum and other contaminants from underground tanks that can harm the environment and human health, according to Benenati. "Without these tests, DEQ has no way of knowing how effective the corrosion protection systems are and whether the tanks are at risk of leaking or whether the systems have failed and a leak has already occurred," Benenati said. There are three underground gasoline storage tanks and one waste oil storage tank buried on the property, according to an assessment of the site by DEQ in 2002. During that assessment inspectors determined that a leak of waste oil had occurred, and removed 22.42 tons of petroleum-contaminated soil. According to DEQ documents, the investigation of the site did not include any assessment of the area around the underground gasoline storage tanks. The gasoline tanks have been drained but not decommissioned, according to DEQ files. The city of Woodburn is not involved with DEQ in enforcing environmental regulations at the site, but the city will have to deal with the gasoline tanks during its First Street Improvement project. Two of the gasoline tanks on the property straddle the sidewalk and street and are in the city's right-of-way, according to Woodburn Economic Development Director Jamie Johnk. Johnk said it was concerning that the tanks' corrosion prevention system had not been tested, but ultimately DEQ is responsible for enforcing compliance and testing the site for contamination. James Frackowiak has been made aware the property owner will be responsible for removing the tanks ahead of construction and has said he will work with the city, according to Johnk. Frackowiak might best be known in Woodburn as the former owner of the old City Hall building. He bought the old City Hall in 2012 for $250,000, according to Marion County Assessor records. In November 2017 the property was sold in a foreclosure auction to a Gresham developer. Frackowiak had owed $376,409 in unpaid obligations from the deed of trust, according to the public notice for the foreclosure auction, as well as $23,000 in unpaid taxes. Frackowiak made the news recently when he was arrested on multiple charges including securities fraud. He is accused of defrauding an elderly Clackamas County couple out of hundreds of thousands of dollars through personal loans and life insurance policies and sales. Frackowiak also faced Bureau of Industry and Labor claims in 2016 from employees at his now closed string of burger companies, Frack Burger, for unpaid wages, and one lawsuit from an employee alleging sexual harassment by a manager. Frackowiak has a trial date set for his alleged securities fraud on November 20. The Grant Street property is currenlty advertised for rent at $2,000 per month.